The annual Raising and Giving (RAG) week, organised by City University London Students’ Union, has raised £2,287 for charity, exceeding last year’s total. The money raised during the charity fundraising week has been donated to Comic Relief, Divya Seva Foundation, Live Below the Line and the Breast Cancer Campaign. Fundraising activities included cake and sweet sales, a ‘Wear it Pink’ breast cancer awareness day, mini-golf and a tug-of-war held in the Drysdale Garden and a Bollywood Night. Students were also offered the chance to ‘soak a sabb’ by throwing a bucket of water at the sabbatical officer who raised the least money. The week of fundraising closed with a club night held at CityBar. Vice President of Activities and Development for the Students’ Union, Natalia Rajapakse, helped to organise the events. She commented: "This Raising and Giving week we endeavoured to spread a little love across campus with fun activities that the City community could get involved with while donating whatever change that could spare in aid of our chosen RAG week charities." 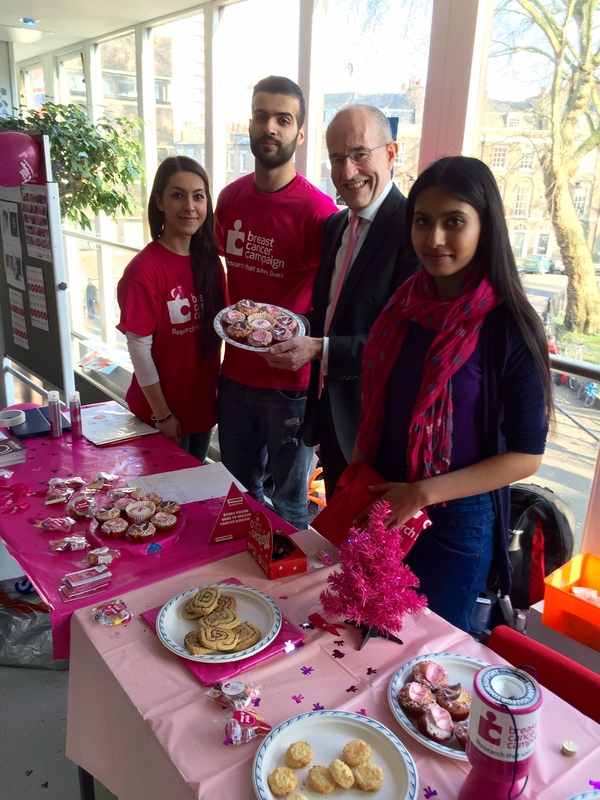 Vice-Chancellor, Professor Sir Paul Curran stopped in the main walkway to buy a cake and wore a pink tie to promote ‘Wear it Pink’ day in aid of Breast Cancer Research.